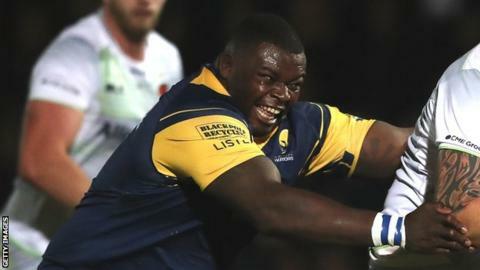 Wasps have signed tight-head prop Biyi Alo on a permanent deal from Championship side Coventry. The 24-year-old made his Wasps debut in their Premiership defeat at Leicester on Saturday, having initially joined as injury cover. Alo came through the Saracens academy before joining Worcester, where he made 30 first-team appearances. "I feel like I have a lot to offer and I want to prove myself back in the Premiership," he told the club website. The length of his contract with Wasps has not been disclosed. Wasps director of rugby Dai Young said: "Biyi still has lots of potential and we are confident we can develop him into a top-end Premiership player as we've seen with other players in recent years."